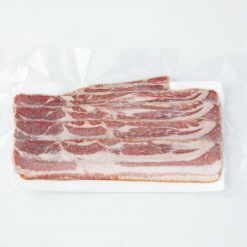 These thick Canadian bacons come in 4.5mm widths and are considered to be thicker than the average bacon. 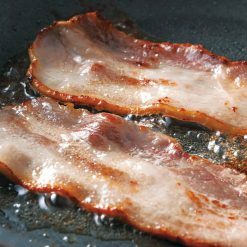 The Canadian pork meat that was used to cure this bacon comes from pigs that were given no antibiotics or other chemicals. Each piece was slicked to a thickness of about 4.5 mm, giving the meat extra texture. Due to our making some weight adjustments, it is possible that the product package that you purchase also contains smaller cuts of bacon. This would include pieces from our catalogue’s product no. “1303 half bacon (150g / 3 bags) 682 (tax included)”, which means that you are receiving an over all 70 Japanese Yen discount per 100g. Thaw in the refrigerator or place the bag under running water to thaw. Please cook the bacon. When thawing under water, the water should be slightly cool to the touch. 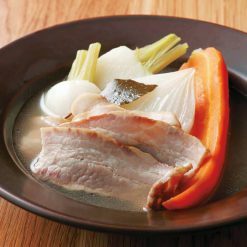 Leave the meat under the water until it has completely thawed. The water does not need to run rapidly- a steady stream would do to defrost your bacon. Bacon can be eaten with your breakfast (as a side to eggs), in a sandwich (with lettuce and tomatoes), in a salad (as your salad topping), in soup (as a salty source of protein), and recently even in your desserts (with peanut butter or in ice cream). Bacon can truly be eaten during all times of the day! This product contains pork meat (Canadian), salt, rice vinegar, seaweed calcium, brown sugar, celery, rice vinegar, yeast extract, gelatin- based enzymatic fermentation product. This product is not suitable for anyone with allergies to pork or gelatin. Origin of ingredients: pork (Canada). Prepared and packaged in Japan.